The Space Bag Features A Unique, Compressible Design That'S Activated By Simply Rolling The Bag To Condense Your Clothing Into A Space-Saving Bag Without A Vacuum. Airtight, Waterproof Construction Protects Your Belongings Against Bugs, Moths, Dirt, Mildew And Other Odors That Might Occur Within Common Storage Areas. Double-Zipper Closure And An Easy-To-Seal Slider Allow You To Quickly Close And Open The Bag For Effortless Use. Plus, The Compressible Bag Can Be Used Again And Again To Let You Change Out The Contents As Needed.. 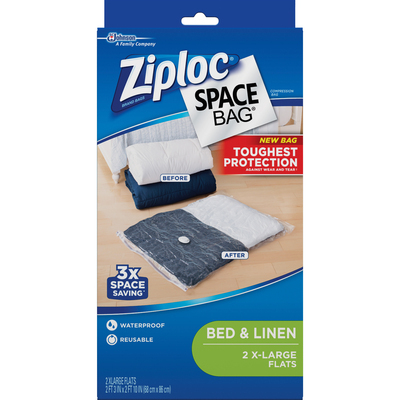 The Space Bag Features A Unique, Compressible Design That'S Activated By Simply Rolling The Bag To Condense Your Clothing Into A Space-Saving Bag Without A Vacuum. Airtight, Waterproof Construction Protects Your Belongings Against Bugs, Moths, Dirt, Mildew And Other Odors That Might Occur Within Common Storage Areas. Double-Zipper Closure And An Easy-To-Seal Slider Allow You To Quickly Close And Open The Bag For Effortless Use. Plus, The Compressible Bag Can Be Used Again And Again To Let You Change Out The Contents As Needed.